Former Anaheim Ducks Head Coach Bruce Boudreau. 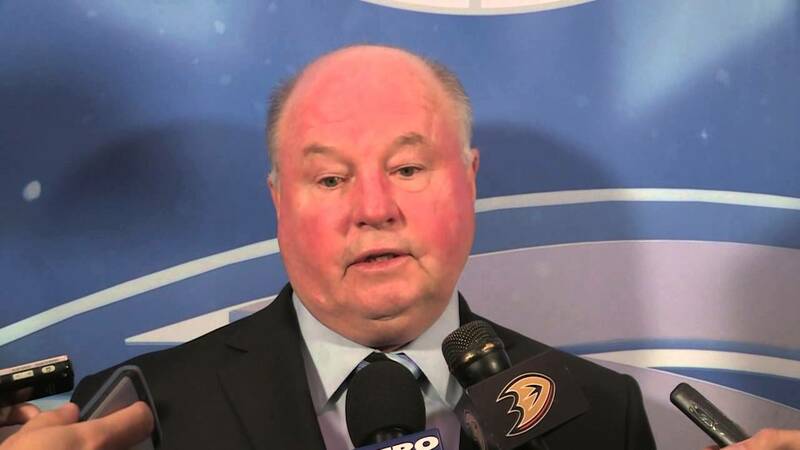 ANAHEIM—Anaheim Ducks Head Coach Bruce Boudreau was relieved of his coaching duties on Friday, April 29. This came on the heels of a Game 7 loss to the Nashville Predators and another early exit from the NHL Playoffs. Ducks Executive Vice President/General Manager Bob Murray made the announcement via a press conference and added that the search for a new head coach will begin immediately. Boudreau was named the coach of the Ducks in November 2011. While at the helm, he compiled a very respectable record of 208-104-40 and contributed to Anaheim winning the last four consecutive Pacific Division titles. Unfortunately, the regular season success that Boudreau saw did not translate over to the playoffs as the Ducks only made it past the second round once, in 2015, before they blew a 3-2 series lead over the Chicago Blackhawks and lost in Game 7, an exact replica of the scenario they found themselves in just a week ago. Boudreau’s inability to win when the series is on the line and get a very talented Ducks team over the hump and into the Stanley Cup Finals has what ultimately ended the relationship. Trent Yawney and Paul MacLean are still listed as assistants.